The Nau Cannonau di Sardinia Italy 2015 from More & Memo has an intense ruby red colour with violet reflections, impenetrable. On the nose it has a bouquet of red berries and spices and coffee with smooth, lingering and elegant tannins with great structure and complexity on the palate. 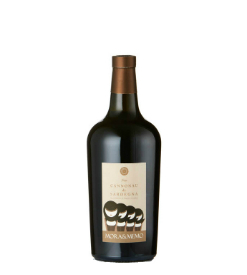 In making the Mora & Memo Cannonau di Sardinia the grapes are macerated on the skins with selected yeasts for about 8-10 days at controlled temperature. After the maceration, fermentation continues in stainless steel vats. At the end of fermentation, the wine continues to refine in wood for about three months, then in stainless steel vats for about six months at the end of the ageing process the wine goes in bottle for three months before its release. The vineyards average 30 years of age with vines planted on a south, south east exposure on limestone and clay hillsides around 200 to 250m above sea level. In a region dominated by co- op’s, Mora e Memo stand out for many reasons. This beautiful estate sits high in the hills in the South East of Sardinia just a few kilometres from the sea. Focused on the indigenous Sardinian varieties of Cannonau and Vermentino the combination of mature vineyards, sensitive farming and a delicate touch in their modern and technologically well equipped cellar results in elegant, vibrant mineral wines- very different from the rustic Sardinian norm. This wine goes well with salami antipasti, pasta dishes with tasty sauces, red meats, mature cheeses. Flagship Wines uses a reliable carrier with a robust national delivery network providing a speedy convenient service to UK mainland addresses. Deliveries are made Monday to Friday and not normally on Saturdays, Sundays or Bank Holidays though Saturday deliveries are possible on payment of an additional charge. If you wish to collect your order from Flagship Wines shop at 417 Hatfield Road, St Albans, AL4 0XP please click on this option at checkout. There is no charge for this service. Delivery in St Albans is FREE for orders over £85, for orders less than £85 the charge is £5. Postal delivery of tasting tickets and vouchers is also FREE if this option is chosen. Our standard national delivery charge is £10 and is FREE for all orders over £250. The standard delivery is next day for all orders placed by 12noon and the following day for all orders received later than that. Please leave clear instructions in the special instructions section on the checkout page so the wine can be left in a safe place to suit you. As our delivery service requires a signature then if your wine is not signed for it is left at your risk and losses are not replaceable. If instructions are not left a card will be put through your door asking you to contact the carrier to arrange re-delivery or collection within 2 days. Please also provide directions in the special instructions box at the checkout to the delivery address if it is hard to find. For charges applicable for delivery to remote addresses such as the Scottish Highlands and Islands please note that different charges apply and these are clearly shown at checkout. The charges are per case of 12 x 75cl bottles and the delivery time will be a little longer due to the location. If you would like to arrange delivery to any addresses that are not covered here please contact us on 01727 865309 or by email to sales@flagshipwines.co.uk and we will ascertain the correct charges for you. If any items you ordered are out of stock we will contact you as soon as possible. Please contact us by phone on 01727 865309 or by email within 48 hours if your wine doesn’t reach you in perfect condition. We hope you enjoy your wines and would love to hear what you thought of them.